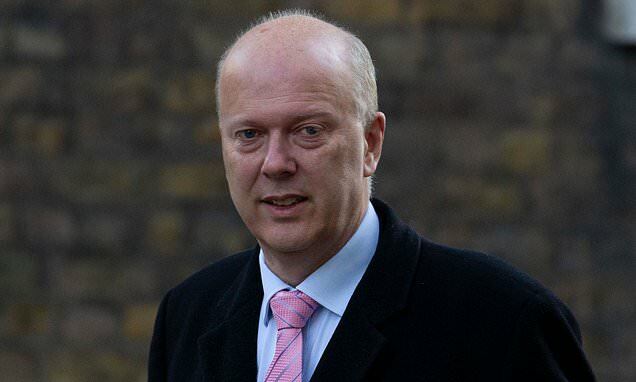 Transport Secretary Chris Grayling came under increasing pressure last night following claims that the security services had to intervene to 'get a grip' on the drone crisis. The Mail on Sunday has been told that National Security Secretariat directors 'stepped in' to take command of the incident early on Thursday afternoon. The covert team liaise between MI5 and Whitehall, and an emergency meeting of security officials was held later that day at the Cabinet Office – without Mr Grayling. Meanwhile ministers are also scrambling to protect against potential copycat strikes at other airports around the country. According to the Sunday Telegraph, Whitehall sources are 'very concerned' over repeat attacks that could 'paralyse' plane travel. Defence Secretary Gavin Williamson told the paper the Armed Forces would assist wherever possible and senior Government figures will meet today to discuss the future response. MI5's intervention came more than 17 hours after the first drone spotted at the Sussex airport unleashed travel chaos – and the finger of blame is now pointed at the Transport Secretary for the dire response. As a war of words broke out, one Whitehall insider said: 'The trouble with the Department for Transport is whenever there is a problem they always rely on 'the providers'. There was too much seeking guidance and not enough action. Last night allies of the Transport Secretary rejected this version of events, claiming Mr Grayling was never in charge in the first place. Friends insist he was still chairing ministerial response meetings on Friday and that the crisis had been a police matter all along.